Since the eighteenth century researchers have been experimenting with organ transplantation on animals and humans. However, the modern era of organ transplantation really began in the 1950s. In its early years, these were truly perilous procedures, fraught with danger, very likely not to be successful in particular instances, and rightly characterized as involving "the courage to fail"—a seminal work of the same name was written by Renée Fox and Judith Swazey in 1974. Over time a combination of advances in knowledge, technology, pharmacology, and practice made it possible to transplant specific organs successfully from one human to another. In North America some milestones in this work include the first successful transplants of a kidney (Boston in 1954); pancreas/kidney (Minneapolis in 1966); liver (Denver in 1967); pancreas (Minneapolis in 1968); heart (Stanford in 1968); heart/lung (Stanford in 1981); single lung (Toronto in 1983); double lung (Toronto in 1986); living-related liver (Chicago in 1989); and living-related lung (Stanford in 1990). Transplants of kidneys, livers, hearts, pancreases, lungs, and heart-lungs are an accepted part of twenty-first-century medical treatment. Twentieth-century specific achievements rested on two important developments. The first was tissue typing, or the ability to classify and compare human tissues. This led to the realization that a graft or transplant will have the greatest likelihood of success when it is most closely matched to the biological characteristics of the recipient. For example, a transplant is most likely to succeed when it takes place between identical twins who share a high degree of genetic material. The second important breakthrough, which has been termed "the most notable development in this area" by the United Network for Organ Sharing, was the scientist Jean Borel's discovery of an immunosuppressant drug called cyclosporine in the mid-1970s. This drug was approved for commercial use in November 1983. Effective immunosuppression prevents the recipient's immune system from attacking and rejecting the transplanted organ as a foreign body. There are side effects to using this drug and clinicians must balance the threat of rejection against the dangers of rendering the transplant recipient susceptible to infection and other life-threatening assaults. When properly managed, however, immunosuppression has saved hundreds of thousands of lives and greatly enhanced quality in living. The growing need for transplantable human organs arises mainly from nonfunctioning or poorly functioning organs in potential recipients. With improved screening practices and diagnostic techniques, individuals who might benefit from transplantation have been identified earlier and more effectively. At the same time, transplant centers have advanced their technical abilities to transplant major organs. Recognizing these developments, in 1984 the U.S. Congress enacted the National Organ Transplant Act (NOTA), which established the national Organ Procurement and Transplantation Network to facilitate the procurement and distribution of scarce organs in a fair and equitable way. The United Network for Organ Sharing (UNOS) administers this network under contract to the government's Division of Transplantation in the Department of Health and Human Services. NOTA also created the Scientific Registry of Transplant Recipients, a system to measure the success of transplantation by tracing recipients from time of transplant to failure of organ (graft) or patient death, which is administered under contract by the University Renal Research and Education Association at the University of Michigan. 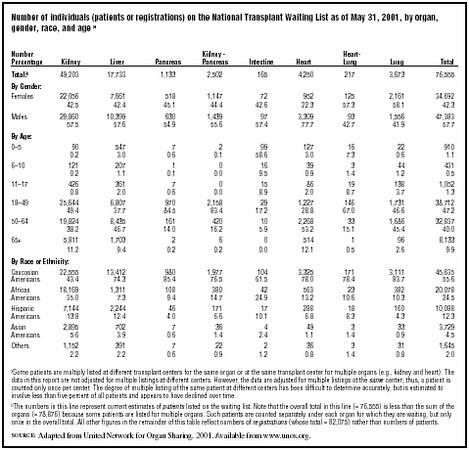 The need for organ transplantation can be seen in data from the National Transplant Waiting List (see Table 1). The top line of this table identifies the major bodily organs that can currently be transplanted: individual kidneys, livers, and hearts; entire lungs, pancreas, and intestines, or portions thereof; and joint transplants of a kidney/ pancreas or heart/lung. Clearly, the greatest numbers of transplant candidates are waiting for kidneys and livers. Table 1 also offers a snapshot, as of May 31, 2001, of the estimated number of patients (76,555) registered on the waiting list by gender, age, and race or ethnicity. Among registrants on the waiting list, the ratio of males to females is nearly 60/40, the largest numbers by age are 18 to 49 years old (followed closely by those 50 to 64 years of age), and the largest numbers by race or ethnicity are Caucasian Americans and African Americans. Table 1 discloses two distinguishing features about African-American candidates on the waiting list. First, they are disproportionately in need of kidney transplants. More than 90 percent of African-American registrants are waiting for a kidney transplant by contrast with 70 to 77 percent of individuals from other minority groups who need such a transplant. This appears to result from elevated rates of high blood pressure, diabetes, and sickle cell anemia in the African-American community, all of which can have a deleterious effect on kidney functioning. Second, African Americans who make up about 12 percent of the overall U.S. population, are present in unusually high numbers on this list—more than 24 percent of all those registered with a U.S. transplant center. 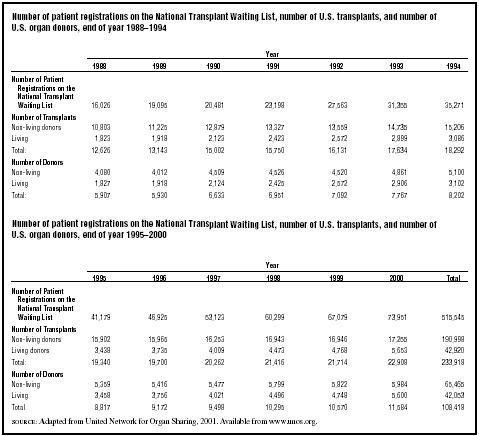 Table 2 reports end-of-year data for numbers of patient registrations on the transplant waiting list from 1988 through 2000, as well as the number of transplants accomplished and the numbers of donors from whom organs were recovered in each of those years. These data and Figure 1 show that during the last twelve years of the twentieth century in the United States the number of patient registrations on the transplant waiting list increased by over 360 percent, while numbers of transplants and donors increased only about 81 percent and 96 percent, respectively. In other words, during this time period the United States witnessed a gradual or incremental increase in the availability of transplantable organs, while there was a huge growth in the need for such organs. Consequently, the single largest obstacle to organ transplantation in the twenty-first century is the scarcity of transplantable organs. In fact, there would be no transplantation of organs if the concept of donation did not exist. For that reason, it is helpful to consider some facts about organ donation and to take note of some efforts that have been made to increase the pool of organs available for transplantation. a Some patients are multiply listed at different transplant centers for the same organ or at the same transplant center for multiple organs (e.g., kidney and heart). The data in this report are not adjusted for multiple listings at different centers. However, the data are adjusted for multiple listings at the same center; thus, a patient is counted only once per center. The degree of multiple listing of the same patient at different centers has been difficult to determine accurately, but is estimated to involve less than five percent of all patients and appears to have declined over time. b The numbers in this line represent current estimates of patients listed on the waiting list. Note that the overall total in this line (= 76,555) is less than the sum of the organs (= 78,876) because some patients are listed for multiple organs. Such patients are counted separately under each organ for which they are waiting, but only once in the overall total. All other figures in the remainder of this table reflect numbers of registrations (whose total = 82,075) rather than numbers of patients. 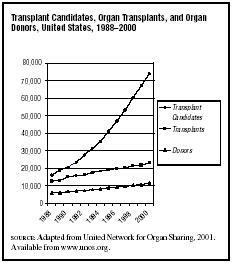 SOURCE: Adapted from United Network for Organ Sharing, 2001. Available from www.unos.org. death do not damage the organs or otherwise render them unsuitable for transplantation. For nonliving donors, this usually means that organs must be recovered shortly after the death of an otherwise healthy donor and before they have begun to deteriorate (the time frame depends on the particular organ in question). In most instances, the donor will have died of external trauma to the head (e.g., as associated with an accident, homicide, or suicide) or a cerebrovascular incident (e.g., resulting from cranial hemorrhage or stroke), and will have been pronounced dead ("brain dead"). Often, some bodily functions in a potential organ donor will be artificially sustained by external intervention for a limited period of time in order to preserve the quality of transplantable organs while decisions are made about donation and a search for appropriate recipients is undertaken. This does not mean that an already-dead donor is "being kept alive"; only some biological functions are being supported externally, not the life of the person. marriage to a potential recipient, to offer a part of their bodies for transplantation. At the same time, although the ratio of organs that are actually transplanted from nonliving donors to those from living donors has declined from 86/14 percent to 75/25 percent, transplantation remains much less frequent from living donors than from nonliving donors. One reason for the infrequency of donation is that living persons can only donate one of a pair of organs or a portion of an organ to a single recipient, while a nonliving donor can donate six to eight major organs, along with ocular components and numerous other tissues that can affect the lives of fifty or more recipients. Still, living donation offers advantages in that the donor's medical history is known, an extensive evaluation can be done beforehand, the organ is removed under elective circumstances, and the donated organ is out of the body only a very short period of time. team will determine death and communicate that diagnosis to next of kin. Wherever possible, an effort will be made to disassociate this declaration of death from issues associated with organ donation. Donation of major organs in the United States does not follow a policy of "presumed consent," although such policies are practiced elsewhere around the world. In the United States, the Uniform Anatomical Gift Act (1968, with amendments in 1987) regulates who may make or receive an anatomical gift, under what conditions, and for what purposes. Permission to donate from nonliving donors must be obtained from an appropriate source. Furthermore, under a government regulation called the Medicare and Medicaid "Conditions of Participation" that went into effect in 1998, hospitals must: (1) report all patients whose deaths are imminent or who have died in their institution to their local or regional Organ Procurement Organization (OPO); (2) ensure the right of next of kin to choose donation; and (3) arrange for trained personnel (members of the OPO staff or hospital personnel whom they have trained for this purpose) to offer the opportunity to donate. It is difficult to approach grieving family members shortly after the (often sudden and traumatic) death of a loved one to discuss organ donation. However, many believe it would be even worse to fail to make this option available to family members at a time when they have been victimized by death and when so little else is within their control, or to have them realize later that they could have found some measure of solace in a dark time if someone had only mentioned the possibility of making a "gift of life." Done properly, offering the opportunity of donation can provide a way of continuing the legacy of an individual's life, assisting family members in their bereavement, and helping others through transplantation. Efforts to increase organ donation have taken many forms. Among them, public education projects have sought to emphasize a number of relevant facts, including "brain-dead" individuals cannot return to life; donor families incur no costs to donate; human tissues and organs cannot legally be bought and sold in the United States; and organ donation usually has no substantive effect on desired funeral practices, other than the possibility of a brief delay. In addition, transplantation is encouraged and supported by nearly all religious communities in the United States; members of minority groups are most likely to find a close tissue match with other members of similar groups and gene pools; a large and growing number of individuals on the transplant waiting list are in desperate need of a transplanted organ; an average of fifteen persons on the waiting list (5,597 in 2000) die each day in the United States because a transplantable organ does not become available for them. These public education efforts are summarized by the slogan, "Don't take your organs to heaven ... heaven knows we need them here!" Similar efforts involve urging potential donors to sign, date, and have witnessed an organ donor card. Such cards can be obtained from the federal government's Division of Transplantation and local, regional, or national organizations, such as the Coalition on Donation, the United Network for Organ Sharing, or the National Kidney Foundation. Many states have a donor card on the reverse side of their driver's licenses and/or encourage applicants for new or renewed driver's licenses to indicate willingness to donate by registering in a computer database. However, individuals who wish to donate should discuss this matter with their next of kin. Regardless of any written or oral expression of wishes that an individual might make, next of kin are likely to be key decision makers in this matter. Lack of discussion among family members about their wishes is the single most significant barrier to organ donation. Thus, public education campaigns have urged potential donors to "Share your life. Share your decision." Two other efforts to enlarge the pool of potential organ donors involve xenotransplantation and what are called "non–heart beating donors." Xenotransplantation is transplantation across species, that is, from animals to humans. At present, xenotransplantation has been successful in cases like heart valves from pigs, but that success has been limited to certain tissues. Non–heart beating donors are individuals in permanent vegetative states who are not yet dead but for whom competent decision makers (their next of kin or those authorized to act for them as substitute decision makers) might decide: (1) to withdraw life-sustaining interventions; and (2) to authorize donation. In such circumstances, the interventions are withdrawn and a brief interval is allowed during which the individual is observed to determine whether or not he or she resumes spontaneous functioning. If the individual is pronounced dead, interventions are resumed as needed to permit recovery of donated organs. From 1993 to 2000 in the United States, organs were recovered from a total of 581 non–heart beating donors. At present, attempts to meet the need for transplantable organs and tissues depend primarily on human donors, generating numerous social, personal, professional, ethical, and legal issues. One set of issues concerns the types of physical, psychosocial, and spiritual care that are appropriate or mandatory for living and nonliving donors, donor family members, and transplant candidates and recipients both before and after donation and transplantation. When a loved one has died and he or she is approached about donating his or her organs, donor family members have been especially concerned that: (1) the need for information and care should be addressed at a time when they are first learning about the death and about the implications of donation; (2) determination of death should be made without regard to donation and their loved one should be cared for with respect and dignity; and (3) their subsequent needs for follow-up bereavement care after the donation decision should be met in appropriate ways. To that end, the National Donor Family Council published in 1994 a "Bill of Rights for Donor Families." Similarly, concerns about specific needs of transplant recipients for ongoing, seamless, and high quality medical, psychosocial, and spiritual care led the transAction Council of the National Kidney Foundation to develop and publish in 2001 a "Transplant Recipients' Bill of Rights and Responsibilities." Further, all of these parties are concerned about implications of donation as a "gift of life" and what may follow from that decision (e.g., are there implied obligations and/or bonds?). Another set of issues involves efforts to increase the availability of transplantable organs. Campaigns to increase public awareness about organ donation and the need for transplantation have not substantially increased the number of available organs. Here, the key issue has to do with consent for donation. In cases involving nonliving donors, some have proposed that formal indications of an individual's desire to donate made prior to death (e.g., through a signed donor card or consent for inclusion in a state donor registry) should become legally definitive, sufficient in themselves, and not subject to being overruled by next of kin. For non–heart beating donors, issues of consent relate to the fact that decisions to withdraw life support and then (after death has been determined) to recover organs are made by next of kin or substitute decision makers acting on the authority of an advance medical directive. There are potential issues about whether the individual is really dead before being returned to interventions designed to preserve the quality of the organs to be transplanted. If so, on what basis is that determined? How long does one have to wait after withdrawing life support before pronouncing death? Why are pain medications sometimes administered to such patients, if they are in fact dead? In addition, there are issues regarding whether decisions to authorize withdrawal of life support and donation are properly made by a substitute decision maker who may be the individual's beneficiary or have some other personal interest in the outcome. In the case of living donors, consent to donate may become problematic if psychosocial pressures or familial influences impose coercion on the potential donor. This would be especially true in cases of child donors. And in all cases of living donors there can be questions as to whether it is appropriate, even with their consent, to impose the risks of major surgery and all that entails on healthy individuals who derive no direct physical benefit from that procedure. An issue for professionals who work with living donors concerns the injunction to "do no harm" because organs do not regenerate and the donor will be permanently impaired. Further, while the buying and selling of human organs is not legal in the United States, some have suggested that funding of some type should be made available, either directly or indirectly, to donor families to facilitate decisions to donate. For example, funds might be paid directly to funeral homes to alleviate some financial burdens on families who agree to donate organs from a loved one. Surveys of family members who have agreed to donate do not report them as favoring such proposals. However, views of family members who declined to donate are not well-known. The first issue that faces potential transplant candidates involves gaining access to the national transplant waiting list. This issue has particular relevance for those who are economically disadvantaged or who are members of minority groups. When such individuals receive their health care services from impersonal institutions or systems in which they do not have full confidence, they may not be adequately informed about how they might benefit from transplantation or not sufficiently empowered to bring up their interest in that possibility. By contrast, individuals with sufficient time, energy, and other resources may be able to gain access to the waiting list more easily and may be able to do so at more than one transplant center. Further, in order to be accepted by a transplant center, one must demonstrate ability to pay for this expensive procedure. There are not any hospitals that can afford to offer many free organ transplants. People who cannot show that they have adequate resources available to them—in the form of funding from Medicare, state assistance, private insurance, or money that they themselves raise— may not be accepted as transplant candidates. Once on the transplant waiting list, discrimination is less likely because organs are allocated to those at the top of the list as determined by criteria that strive to ensure equity in terms of antigen matching, how sick the person is, and how long he or she has been on the list. However, when insufficient numbers of transplantable organs are available (as in the United States), issues still exist concerning whether these scarce resources should be allocated: (a) locally or regionally before being made available nationally or (b) to the sickest individuals first on the waiting list (regardless of geography). It has been argued that local or regional allocation would encourage individuals to donate in support of their local communities. The counterargument is that allocation without regard to geography would direct organs in the first place to individuals on the waiting list who are the sickest and most in need of a transplant. Proponents speaking on behalf of the primacy of local and regional allocation reply that those who are sickest have a lower likelihood of long-term success as transplant recipients. From another perspective, in light of the typical pool of patients that each serves, it has been suggested that giving primacy to local or regional organ allocation tends to favor smaller transplant centers over larger, national transplant centers that tend to enroll sicker patients on their waiting lists. Further, funding is an ever-present issue in this field for the recovery of transplantable organs and tissues, for transplantation itself, and for the long-term support of transplant recipients. To the issue of funding, one can add issues involved in the "commodification" of transplantable organs and especially human tissues that, once processed, have a long shelf life and seem to many to lose their connection to their original source in a human body. Has this led to excess profit making by some tissue banks and processors? Does it all imply an unwillingness to realize that in the end death is part of the human condition? In addition to organs, it is also possible to transplant human tissues such as skin grafts for burn and accident victims; heart valves and aortic patch grafts to sustain heart functioning; saphenous and femoral veins, which are used in cardiac bypass surgery; eye and ocular components to restore or improve sight; and bone and connective tissue grafts, which make possible periodontal and trauma reconstructions, as well as spinal fusions. Because blood and fat cells are removed during the processing of donated tissues, there is usually no issue of rejection after transplantation and many tissues can be sterilized, frozen, and kept in storage often for many years. Upwards of 400,000 tissue transplants are accomplished each year in the United States. Conversations about retrieval of transplantable tissues may be part of the overall discussion of organ donation or they may occur independently— often in the form of a telephone conversation rather than a face-to-face interaction. In the former instance a procurement coordinator from an OPO might be the principal professional in the discussion; in the latter instance a staff member from a specialized eye or tissue bank might assume that role. Authors for the Live Organ Donor Consensus Group. "Consensus Statement on the Live Organ Donor." Journal of the American Medical Association 284, no. 22 (2000):2919–2926. Caplan, Arthur L., and Danile H. Coelho, eds. The Ethics of Organ Transplants: The Current Debate. Amherst, NY: Prometheus Books, 1998. Corr, Charles A., Lucy G. Nile, and the Members of the National Donor Family Council. Bill of Rights for Donor Families. New York: National Kidney Foundation, 1994. Fox, Renée C., and Judith P. Swazey. Spare Parts: Organ Replacement in American Society. New York: Oxford University Press, 1992. Fox, Renée C., and Judith P. Swazey. The Courage to Fail: A Social View of Organ Transplants and Dialysis. Chicago: University of Chicago Press, 1974. Prottas, Jeffrey. The Most Useful Gift: Altruism and the Public Policy of Organ Transplants. San Francisco, CA: Jossey-Bass, 1994. The transAction Council. Transplant Recipients' Bill of Rights and Responsibilities. New York: National Kidney Foundation, 2001. U.S. Department of Health and Human Services, Health Care Financing Administration. "Medicare and Medicaid Programs; Hospital Conditions of Participation; Identification of Potential Organ, Tissue, and Eye Donors and Transplant Hospitals' Provision of Transplant-Related Data." Federal Register 63 (1998):33856–33874. U.S. Department of Health and Human Services, Health Resources and Services Administration, and Health Care Financing Administration. Roles and Training in the Donation Process: A Resource Guide. Rockville, MD: Author, 2000. Wendler, Dave, and Neal Dickert. "The Consent Process for Cadaveric Organ Procurement: How Does It Work? How Can It Be Improved?" Journal of the American Medical Association 285, no. 3 (2001):329–333.